Even severely aged asphalt will soften when heated (about 290 deg. F, 140 deg. C) to the flow point of the asphalt cement. INFRARED heaters are able to evenly raise the temperature of the asphalt repair area without burning or destroying the serviceability of the pavement. After heating to the proper temperature, the pavement mixture becomes fluid and can be raked level. Then the new hot mix asphalt is added to bring the repair area level with the existing asphalt around the repair. Leaving a seamless infrared asphalt repair. Without this new equipment, it would have previously taken 5 – 6 hours to repair a pothole that is 6’ x 8’. We are able to handle asphalt repairs quickly and economically, providing a superior finished product, using infrared (seamless) repairs. Cost Effective - Since infrared repairs can be completed quickly, the cost of labor is kept to a minimum. There is also cost savings in raw materials. We can pinpoint exactly where the asphalt needs to be patched and use less materials. Less Traffic Interruptions - Asphalt can be driven on in a short period of time after it has been installed. Our trucks / equipment can be mobilized quickly and efficiently around the clock so you never have down time conducting your business. Failed Pavement - Raveled, alligator cracked or fatigue cracked asphalt will need to be repair in other ways. A new asphalt overlay or repairs to the base course may need to be done for a long term solution. Is excessive repairs needed in your parking lot? Asphalt pavement repair or patching may not be beneficial in this case. 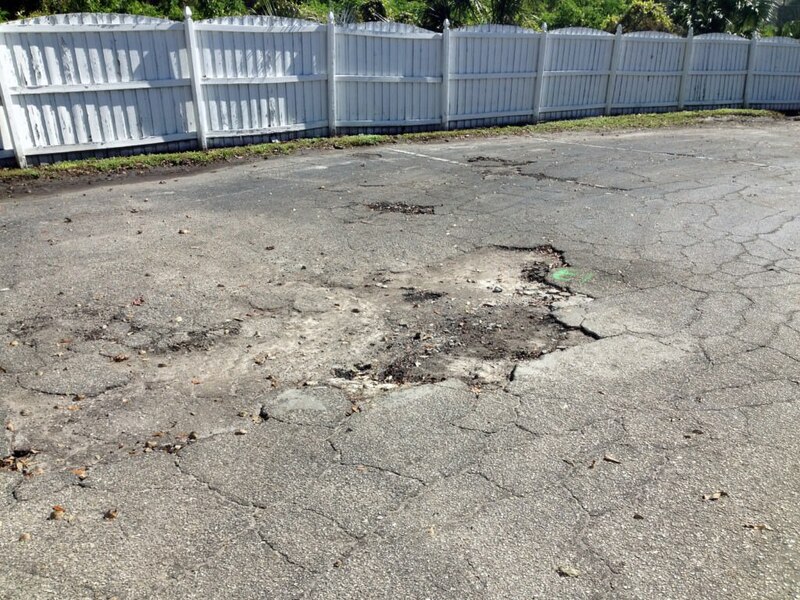 If your lot has over 25% of damaged asphalt it could be beneficial to an asphalt overlay across the entire surface.